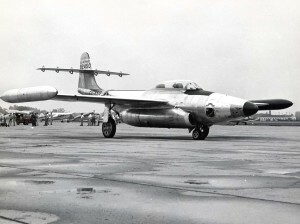 On March 4, 1965, a Vermont National Guard F-89J Scorpion jet was approaching Burlington Airport when an onboard fire broke out. The aircraft went down about three miles form the airport in the town of Williston, in an area known as Taft Corners, barely missing some trailer homes. (Pilot) Colonel Robert P. Goyette, 45, of Burlington, Vermont. (Radar Observer) Lieutenant Jeffrey B. Pollack, 28, of Burlington, Vermont.